Writers are often asked exactly how they manage to do what they do. Do they have any preferred routines or methods that help them finish their books? It's something that every author has a different opinion on. 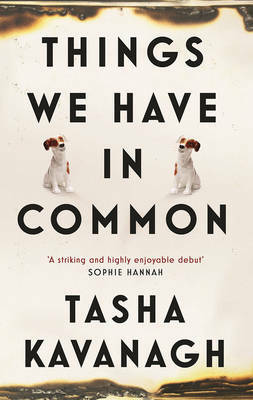 Tasha Kavanagh, author of the recently published Things We Have in Common has decided to pre-empt some of these questions and offer her own tips and tricks for any would be writers out there. A writer friend of mine (and avid dog lover) says the secret to writing and finishing a story can be summed up in a couple of words: ‘Sit! Stay!’ This pretty much covers the business, as long as you add to it love, loyalty and truthfulness. If you can, your story will not only get finished, but will probably be pretty good, too. Whether you have an idea for a story, or whether you want to write a story but don’t have an idea yet, I would say the most important first step is to commit to writing it. Don’t worry about how long it will take you or how you’re going to go about it, but do take your commitment seriously because committing to write your story will make the difference between never getting around to it/giving up and keeping going/finishing. Ideas for stories can, of course, come from anywhere - real or imagined - and writers habitually have their eyes and ears open for any. It’s important to actively look for ideas, or at least to be receptive to any that might wander across your path, because if you simply wait for an idea to come and find you, you could be waiting forever. Most likely, whatever kind of story you love to hear, watch or read about will also be what you’d love to write. Look for an idea that appeals to you, then when you find one, mull it over for a few days. Of course, any idea is good in principle – so long as it’s discovered and developed by the right person for it. Ultimately, it is your own taste and instinct that will tell you if an idea is really the one for you. Like finding a true friend, you’ll know when it happens because you’ll feel it. You will most likely, at that point, have absolutely no idea how you will turn your idea into a piece of brilliant fiction, just like you can have no idea what the future holds when you first encounter a soul-mate, but nevertheless, this idea is one that moves and excites you, that you can sense, if handled well, could grow into something profound. Once you have found your idea, let it into your life. Spend time with it. Look after it. Think about, work on and play with it every day. A daily writing time and place can be a great help, but it isn’t essential. Doing the writing is the only essential bit! Write anything around it in whatever form you like – notes, prose, dialogue, stage directions, plot outlines, etc. Write a scene – it doesn’t matter where from in the story. Write the most exciting one. Maybe this would be a good scene to open with? And write in the way that comes most naturally to you. I generally write in first person, because I’m most comfortable writing from inside a character. I find that way, even if I later go back and change to second or third person, I can get into the story more easily and find what’s interesting about the character in relation to the story. Don’t worry about point of view or voice in the early stages. Just write. Whether you’re happiest building a plot structure before you begin the actual writing, or you prefer to leap in an see where things go, be prepared for the bad days that you will inevitably encounter – the days when you feel that you can’t do it, that it’s too hard, that you’re not good enough. I am yet to meet a writer that doesn’t have plenty of these days, no matter how many books they’ve published. Accept that you will meet feelings of resistance, then, and that when you do, you will simply carry on. It’ll be worth it, because beyond the bad days are the good days and the wonderful days, when everything seems to be falling into place, when you believe you actually might be able to write this amazing story after all! When writing feels hard to get into, one thing I find can help is reading a book I love that has the tone or feel that I’d like to capture in my own writing. I read a page or two, then feeling inspired, I write. Something else I’ll do, if I’m feeling reluctant to write a scene is to simply write the dialogue as though it’s a script. I just start and see what the characters say to each other. It’s easier to go back, then, and add in all the other bits like internal thoughts, descriptions etc. Remember that if you are spending time with your idea, you are working. You don’t have to be adding to your word count to be writing. And finally, my advice would be forget about all those writing ‘rules’. Forget them. Writing that sings is writing that’s truthful, and you can’t be truthful if you are writing self-consciously. Step inside your story, be the character/s and think only about relaying what’s happening there in the simplest possible way. I don’t develop a plot structure/outline before I begin writing. It just doesn’t work for me. I find the only way I can write is to jump in, start the engine and work out the route as I go. Having said that, a sense of destination is important. If I have a feeling for how the idea could play out – where my protagonist will end up – I know I will eventually reach that place. When I began Things We Have In Common I knew, more or less, where Yasmin would be, psychologically, in the final paragraphs – that is to say, I knew the tone of the story. That was pretty much all I knew, but it was enough to give me the confidence to keep going and the assurance that I wouldn’t unexpectedly find myself stuck in a dead end. Like driving in the dark, so long as you know where you’re headed and you have headlights to show you the bit of road ahead, you can manage without a map. Finally, find and do things that inspire you. Go to talks… read… join a writing group… or a philosophy group… visit art galleries… walk… Do whatever works well for you, and when you do them, take your idea with you.